If you have been to a local Lowe’s or Home Depot store than you are already familiar with the brands Hampton Bay and Harbor Breeze. Is there a major difference between the two? How are Hampton Bay and Harbor Breeze the same? We’ll go over everything from build quality to light kits in this helpful comparison guide. Hampton Bay is owned by Home Depot and acts as it’s house brand for ceiling fans, lighting fixtures and outdoor furniture. The brand itself has been around since 1986 and focuses on offering budget options in a variety of popular styles. Harbor Breeze is the official Lowe’s ceiling fan house brand. Much like Hampton Bay, Harbor Breeze focuses on budget ceiling fan options. Although sold at Lowe’s, the ceiling fans themselves are manufactured by Litex Industries. Litex Industries is an importer of ceiling fans and lighting fixtures also owns the ceiling fan brand Craftmade. Verdict: Both brands cost about the same with Hampton Bay offering more mid-range models. When it comes to price comparison, Harbor Breeze and Hampton Bay are very similar in price. Harbor Breeze offers a generous selection of budget ceiling fan models that range from $45 to $199 on the most expensive end. Hampton Bay on the other hand offers similar budget models that start around $39 wile their mid-range ceiling fan models can cost as much as $299. The more expensive Hampton Bay ceiling fans are usually larger and include more features. To see how Hampton Bay compares to a higher end brands like Hunter, then check out our Hampton Bay vs Hunter ceiling fan brand comparison. Because Harbor Breeze and Hampton Bay are house brands both serve the budget ceiling fan market, neither brand holds an edge on pricing. Where you will most likely see a price difference is during sale events at either Lowe’s or Home Depot where markdowns on ceiling fans may give one brand a competitive edge over the other. Subtle differences between Hampton Bay and Harbor Breeze 52-inch ceiling fans. Verdict: Both brands have similar build quality yet Hampton Bay has a slight edge with their mid-range ceiling fan models. When it comes to build quality and materials used, Hampton Bay and Harbor Breeze share more in common than they differ. Both brands use ABS or Plywood blades in most of their ceiling fans. We have yet to come across a model that uses metal or real wood blades in Harbor Breeze ceiling fans. While Hampton Bay only upgrades their ceiling fan blade materials on their most expensive models. Light kits are usually made of glass or plastic on both brands. You also won't find much difference in motor quality and energy efficiency as each brand uses similar quality motors. Almost all Hampton Bay and Harbor Breeze ceiling fans use 3-speed reversible motors. Although the cutting edge of ultra quiet motors lies in DC motor technology, both Harbor Breeze and Hampton Bay still only offer AC motors in their respective models. The lack of advanced energy-efficient motors is common with budget ceiling fans who are competing to keep their prices low. Where you’ll see a slight edge is in Hampton Bay’s mid-range ceiling fan designs that offer extra features and design elements such as real wood blades, decorative motor housings and advanced wall controls. These ceiling fans are usually sold above $199. Although not high end when compared to other ceiling fan brands, Hampton Bay’s mid-range ceiling fans are usually better quality than their cheapest budget fans. To see how Hampton Bay compares to a higher end brands like Hunter, then check out our Hampton Bay vs Hunter ceiling fan brand comparison. Sometimes a ceiling fans light kit can be an afterthought when purchasing a new fan. But changing light bulbs is part of ceiling fan ownership and being able to find the correct bulbs easily should be a part of your purchasing checklist when shopping for a new fan. 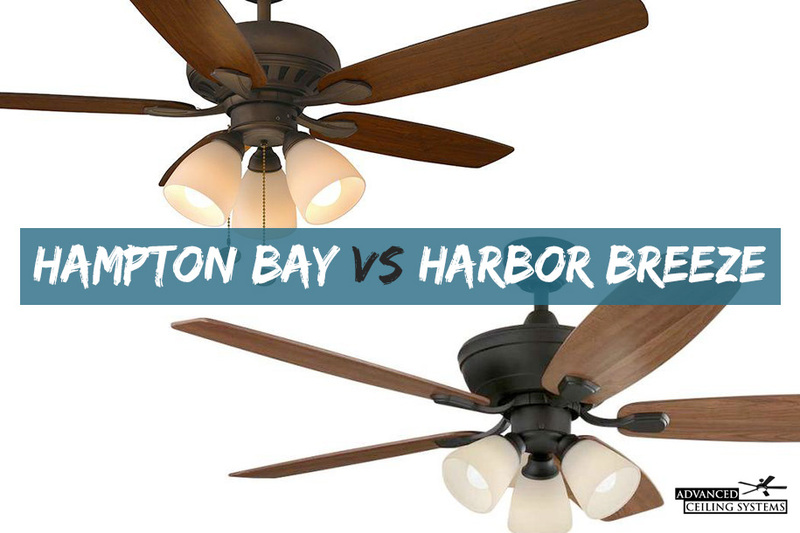 Both Hampton Bay and Harbor Breeze use different types of bulbs in their ceiling fans. This is something to consider when choosing between the two. Most Harbor Breeze light kits use small Candelabra (E-12) bulbs. Although some modern Harbor Breeze fans are being released with a completely integrated LED light kit that does not require light bulbs since the lights are built in. The light kit depends on the ceiling fan model, so make sure to read the specification to see which kind you will be purchasing. Like Harbor Breeze, many Hampton Bay ceiling fans also use Candelabra bulbs in their light kits. A few of the newer Harbor Breeze models do include “bulbless” LED light kits that have their lights built in. If you would like to use household medium size bulbs in your ceiling fans, then Harbor Breeze offers a few ceiling fans with light kits that use medium bulbs. This is a big plus for anyone who does not want to bother with looking for special sized bulbs when it’s time to change them. Harbor Breeze offers a Limited Lifetime Warranty for most of their fans. This covers the motor and some manufacturer’s defects. Hampton Bay also offers a Lifetime Motor Warranty for it’s motors. Both Lowe’s and Home Depot offer additional warranties that cover parts and labor when you purchase a ceiling fan either online or in-store. Since both Harbor Breeze and Hampton Bay are house brands for big-box stores it’s important to note that any manufactures warranty claims will have to go through either Lowe’s or Home Depot respectively. Both brands offer very similar models in the same price range. Unfortunately, you will not see much difference in materials, motor quality or build at the lower end. Those looking to purchase a fan under $150 will find quality, airflow and energy efficiency to be about the same whether they purchase a Hampton Bay or Harbor Breeze ceiling fan. Where Hampton Bay has a slight advantage is in their mid-range ceiling fans that cost between $200-300. Here you will start to see an upgrade in materials in more interesting designs. Hampton Bay also wins when it comes to their light bulb connections, as they offer models that use regular medium base bulbs. Although Candelabra bulbs are great for low power consumption, most candelabra bulbs are capped at 40 watts and do not offer much light. Today’s medium base LED bulbs offer similar energy efficiency and more powerful lighting.